After purchasing my FNAR 7.62x51 (.308) Standard Rifle (check out my review when you get a chance), my next task was to find a scope that would meet my needs. Since my rifle setup will probably drop more deer, hogs, coyotes and beavers, I wanted something that is clear and bright. Bright was really important because I see more deer in the last moments of the day than any other, and hunting in a county that has antler restrictions, I don't want to miss that monster buck because I couldn't ID his rack. The land I hunt can have many shots between 200 and 300 yards on a regular basis. Also, I plan to go out west hunting and decided that I wanted a little more optical range than my existing hunting rifle (3-10). Last, because of the longer shots, I wanted some type of features to account for bullet drop and parallax adjustments. If money were not an issue, I would have selected the Swarovski. But since I'm not a rich man, I had to wake myself up from that dream. The next to fall was the Burris. Not because of any technical issues, but because of all the negative posts out there on their customer service. In my mind, if I were to sink hundreds of dollars into a scope and it had some type of issue, I would want a great customer service department to make things right. I personally have not had any dealings with them, but I just didn't want to chance it on the scope. The two that remained were the Leupold and Zeiss and each time the wind changed direction, I would switch on which one to get. In the end, I got the Zeiss from Opticplanet.com for $849.99. It came down to me wanting the Target Turrets and not the CDS system from Leupold. This review is not meant to be a showdown between scopes, but a review of my final selection, so here I go. The photos below show what is in the box and the marking on the end of the box. To be honest, I was a little surprised when I opened the box. I'm notorious for purchasing cheap scopes and one of my favorites (NcStar) gets all fancy with a zippered bag. Maybe I thought a Zeiss would have come in a felt bag like a bottle of Crown Royal. Anyway, it doesn't matter because I wouldn't have used it. In an attempt to not sound like a duffus, I'm going to tell you to beware when your order this scope. I'm also going to make it all sound like Amazon.com's fault. I ordered the scope from Amazon and got a great price. When it arrived, it was not what I ordered. The photo on Amazon showed the exact scope I wanted (target turrets), but the one that arrived had hunting turrets (basically just caps over the elevation and windage adjustments). When I looked at the order details, sure enough, I ordered the hunting turrets according to the model number, but the photo fooled me. Don't make the same bonehead mistake. FYI, the one on Amazon was $100 cheaper. In frustration, I went directly to Opticsplanet and ordered the correct one because I couldn't find it on Amazon and was getting impatient. Since I already mounted the scope on my FNAR, it would be hard to show photos of the scope without also showing photos of the rings. The rings I selected were the Burris XTR Xtreme Tactical Rings. They come in four different heights. These are extremely beefy rings and have the option to replace the cap with a picitany rail cap. I decided to go with the picitany cap on the forward ring because I'm thinking of potentially mounting a red dot sight at that location. I think that having a minimum 4.5x power scope limits my abilities for a quick shot at close ranges. I was able to use the medium height rings for my setup. I knew it was very close to not working out, but I was willing to take the risk because I wanted to keep the scope as close to the rifle as possible. You can see in the photo below how close it was. Considering eye relief on the scope, limited range of attachment for the forward ring on the scope, specific slots on the rail, and trying to clear the 50mm objective, there was a single sweet spot that allowed all this to work together. In the end, I'm very pleased. OK, back to the Zeiss Conquest review. The following in italics were taken directly from the Zeiss website. My scope also comes with the Reticle 4 shown further below. Several other reticles are available, but at Opticplanet, they would have cost significantly more and I was really stretching my budget. 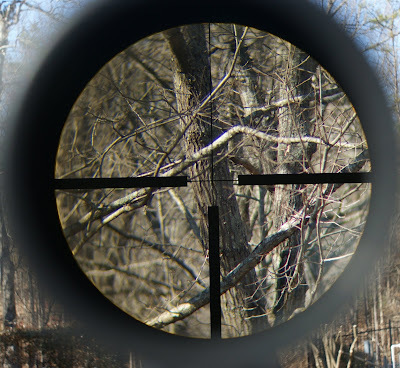 My original choice would have been a duplex reticle, but this one is very similar. I'm very please with the overall look of the scope on my FNAR. You can also see I have added a Zeiss 50mm Sunshade along with a Butler Creek Flip-Open objective cover. The power adjustment ring and the diopter adjustment have a firm smooth feel when you rotate them. 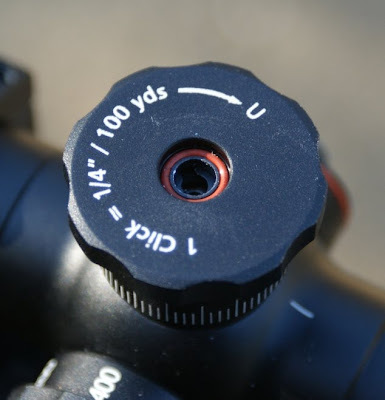 The parallax adjustment knob is adjustable from 30 yards to infinity (markings on the knob show 30, 50, 100, 200, 400, 800 and infinity). In the photo below, it is set at 50 yards. Under normal hunting situations, I will set this at approximately 100 yards, which is the normal value for fixed parallax scopes. I'm sure if I'm doing some long range shooting, I will tweak as required. The body of the scope has marks showing where you would readjust your turrets when going back to your zero. 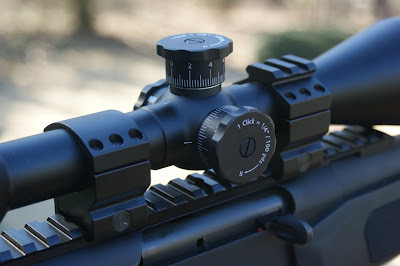 After you sight in your rifle, you remove the turret caps and reset them to where the "0" mark on the cap lines up with the reference mark on the scope body. Each mark on the turret cap represents a 1/4" MOA adjustment (1 click). Therefore the numbers represent whole MOA adjustments. One full turn of the knob represents 18 MOA. The sunshade can be mounted by unscrewing the objective bell lip protector, screwing in the sunshade (very similar to how a camera lens works) and then screwing back on the lip protector. As you can see, I added a Butler Creek Flip-Open Objective Cover. The size of the cover is the 39 OBJ (2.220" or 56.4 mm) and if fit like a glove. You can see that there is still a little more room for me to push it on further, bit since it was very tight at that point, I decided to not cover the markings on the sunshade. If it works loose at the range, I will shove it down all the way. I did not mount a cover on the eye piece because I wear bifocals and for some reason I tweak the diopter setting more than I should. 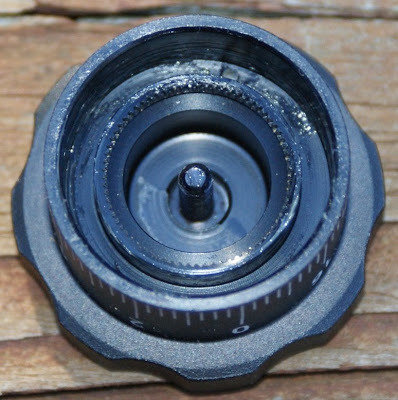 Each turret cap has an o-ring under the attachment screw. This prevents moisture and dust from getting down inside the adjustment area. O-rings also are located on the adjuster knob and the main body of the windage turret. You can actually feel pressure build up under the windage cap when you replace the cap. This is due to the tight seal and indicates that no moisture or dust will ever get inside this area. The Zeiss Owner's Manual has this to say about the sealing of the turret area: "Proper sealing is also guaranteed when the screw caps of the windage and elevation adjustments have been removed. However, always make sure the caps and sealing rings are firmly seated." The turret caps engage the adjuster knob with the series of teeth. This series of photos is intended to show the brightness and clarity of the scope at different powers. I'm not sure if these will be the final photos for the post because I need to make sure my depth of field settings on my camera were not changing the way you would see it if you were looking directly through the scope with your eyes. You can notice the short depth of field in the 14x photo. 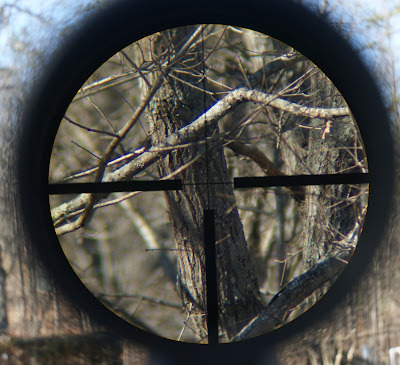 Also, I had the parallax adjusted to 50 yards, which was the approximate distance to the tree. This may also be contributing to the depth of field. Further investigation shows the parallax adjustment does change the depth of field that objects are in focus. 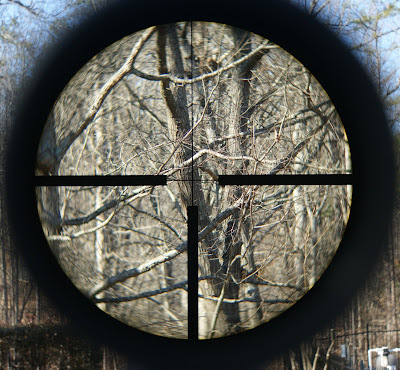 In this case, the parallax was set to 50 yard (the tree was about 50 yards away), and other objects farther in the background were no longer in focus. Great Read! Thanks for the review, it was very helpful. I also had a problem with Amazon, the vender was Gearstuff and they did indeed send the non-target turret model when their sale page most def. said and showed a target turret version. Fast return, no questions asked and a couple days later a I had the right one in the mail. I PCS in May, the scope and a Remington 700 LTR are waiting for me in my home town!!! 6 days left! Thanks again for the review! Good read. 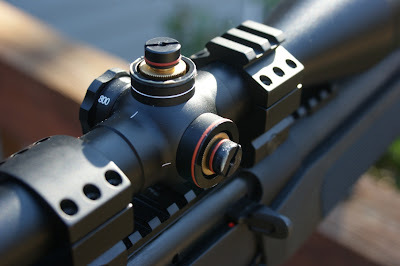 Just ordered my scope from ----- and got a heck of a deal (close to $150 cheaper than optics planet). Zeiss conquest 4.5-14X50. Can't wait to mount it on my 22-250. OK, you are killing me. $150 off, that's a great deal. Did you get the target turrets? They charge more for that (not sure why). I should have not gotten impatient when I had the hickup with Amazon. I can say honeslty, that I have been nothing but pleased with my scope. I didn't realize how nice the scope was until I spent time on the range testing my FNAR and then switched back to my old XXXXXXX scope letting my rifle cool down. Man what a difference. If for some reason you are not happy with the scope, then please give some feedback. Love the scope.... I have attempted to sight it in, however the rings were WACKED and the scope was more than 12 inches off (to the left)... Or my barrel is bent :)... I have decided to change rings and bases and will shoot next week. If you ever need a scope or gun call the fellas at RED HAWK RIFLES. (Cedaredge, Colorado) They are great guys and very helpful!!! Just purchased a 6.5-20x from "SportOptics.com". With $150.00 visa card rebate the price was $795.00. Rebate good until end of September 2010. Thanks for the pictures showing the Target Turrets and explanation. It helped me better than the instructions as I was confused somewhat concerning the turret cap replacement and zeroing. 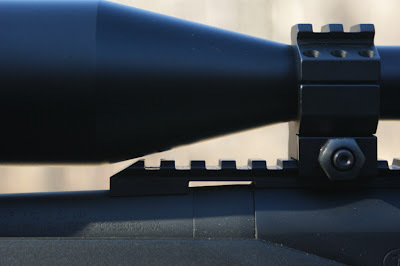 Burris Signature rings work very nicely and protect the scope from ring markings. 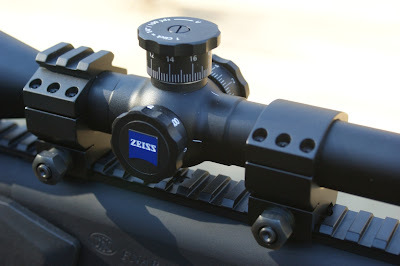 Great choice, the Zeiss Conquest is one of the best scopes out there. You won't be disappointed. If you are ever in the market for another Zeiss scope, come check us out. 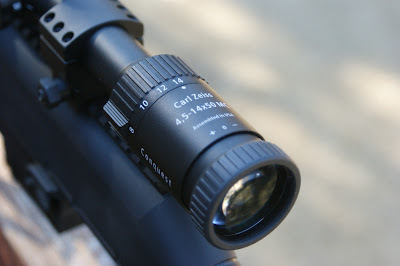 i just ordered a ziess 4.5-14X50mm for my 22-250.
cant wait...i saw the scope at bass pro shops...way clearer than the leupold. no animal will get away from me now! Great review. It truly is a beautiful thing. I just treated myself to a FNAR for Christmas. 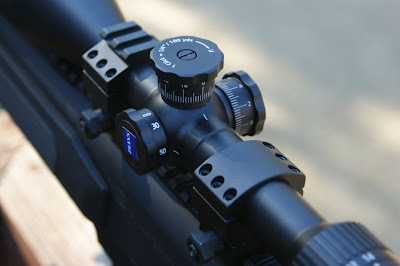 I'm wondering did you have to lap the scope rings prior to mounting the scope? Also I cannot seem to find any specific inch pound torq specifications for the Burris XTR XTREME tactical rings. Thanks for your observations. Even if some time passed this is a very useful review, thanks. 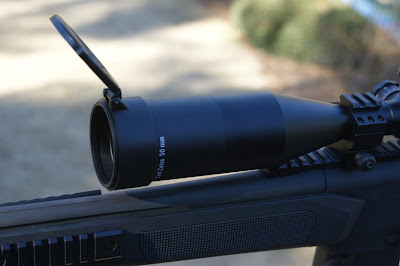 I am looking for something for my .22lr/.22 wmr rifle (CZ455 thumbhole varmint) and just now considering the Zeiss conquest 4.5-14x44 or the 50 (too big and clumpsy for the rifle?) discussed here. Will use for both fox hunting (evening), bigger forrest birds and high altitude winter hunting, again mountain birds or other small things and also often diffcult lightning since we are taking north Sweden. Any thought on that from you guys? I think the key to using this type of variable power scope will be making sure it has a parallax adjustment and you use the adjustment. If you are zooming in close at relatively short ranges (i.e. less than 50 yards for .22LR) and have small targets, parallax can be significant. This scope does have that adjustment and it is a quality bright scope. I feel you would be very pleased with this scope. Good luck hunting!